.... "While there should be included among its writers the best students of Africa in the world, I want the proposed Encyclopaedia to be written mainly from the African point of view by people who know and understand the history and culture of Africans." The legacy of the Encyclopaedia Africana Project and the Encyclopaedia Africana Dictionary of African Biography 20-volume set, dates back to 1960, in Ghana, West Africa, when W.E.B. 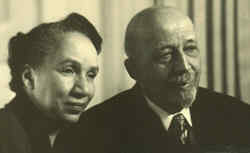 Du Bois witnessed the inauguration of the independent Republic. At that time, First President Osagyefo Dr. Kwame Nkrumah, asked Dr. Du Bois if he would plan an Encyclopaedia Africana. Dr. Du Bois consented to do this and to consult personally and by letter a number of persons who might be interested in this project. Articles written by various scholars and advisors of the Encyclopaedia Africana Project, organized by scholar/advisor and in chronological order. Articles written by various scholars and advisors of the Encyclopaedia Africana Project, in chronological order. Articles written by the Director of the Secretariat of the Encyclopaedia Africana Project: status reports, statements, press releases, responses to social commentary, etc., in chronological order. Articles written by members of the Encyclopaedia Africana Project Editorial Board, in chronological order.